"This automatic feeder's digital timer programs up to 12 meals per day...easy to disassemble for cleaning and dishwasher safe." "Made from super strong, heavyweight plastic...composed of FDA-approved plastic that’s safe for contact with food and water." "Virtually impossible to turn over...and a high-gloss finish, which makes cleaning and maintenance easy." "Extremely durable, bacteria-resistant and easy to care for...with a removable, soy-based rubber base that prevents skids and spills." "Elevated dog bowl totally contains splashes and spills, and actually separates spilled food from spilled water." "Bacteria-resistant, easy-to-wash stainless steel bowls and a spill-proof silicone mat...to catch any food or water spills." "Super sturdy frame prevents spills, tipping and nudging during mealtime." "The mazes within this bowl are designed to slow your dog’s eating significantly... for improved digestion and less bloating." Dogs like to be fed on a schedule and this automatic feeder from PetSafe makes it super easy. Its digital timer programs up to 12 meals per day with food portions ranging from 1/8 cup to 4 cups. This feeder’s pet-proof reservoir can hold 24 cups of dry food, while its stainless steel bowl can hold up to five cups. If your dog is a quick eater, program the slow feed mode. It dispenses meals larger than 1/8 cup over the course of 15 minutes to prevent gulping. This feeder is easy to disassemble for cleaning, and some parts—like the bowl — are dishwasher safe. It requires four D Alkaline batteries to run, but you can purchase a power adapter (sold separately), too. Plastic dog bowls are very durable, so they won’t break if they’re dropped or flipped. Plus, they're inexpensive and, oftentimes, machine washable. The downside? They can be scratched or chewed easily, leaving spots for old food and bacteria to build up. If you’re looking for a plastic dog bowl, check out this pick from Van Ness. It’s made from super strong, heavyweight plastic, so it won’t be so easy for your dog to damage the surface. It’s composed of FDA-approved plastic that’s safe for contact with food and water. This bowl comes in several sizes from small to extra-large to suit your dog’s nutritional needs. One thing to note: although the listing shows a white bowl, reviewers note that colors may vary. Although they’re more fragile, ceramic or stoneware dog bowls can be much prettier than your standard dog bowl. Yes, really! They often feature fun designs or color patterns, so you can match Fido’s dishes to the family’s dishes. This ceramic bowl from Ethical has a cool color pattern and a high-gloss finish, which makes cleaning and maintenance easy. Ethical's bowls are available in several sizes, from 5” in diameter to 9.5” in diameter, making it simple to choose the perfect volume for your pet. Plus, this bowl is dishwasher safe, making clean up extra easy. With over 900 reviews, it’s clear that pet parents love this stainless steel dog bowl from Loving Pets. Not only is stainless steel extremely durable, but it’s bacteria-resistant and easy to care for. Just toss this dog bowl in the dishwasher a few times a week for simple maintenance. Plus, at under $10, this dog bowl has an extremely wallet-friendly price tag. This bowl features a removable, soy-based rubber base that prevents skids and spills, eliminates noise and protects your home’s flooring from scratches. Just be sure to remove the rubber ring from the bottom before putting this bowl in the dishwasher — it can melt under higher temperatures. This bowl can hold up to one quart of food or water and is available in four sizes ranging from small to extra-large. There are also five colors to choose from. Although its stainless steel composure is very durable, keep in mind that this bowl is not heavy, so your dog may be able to turn it over. 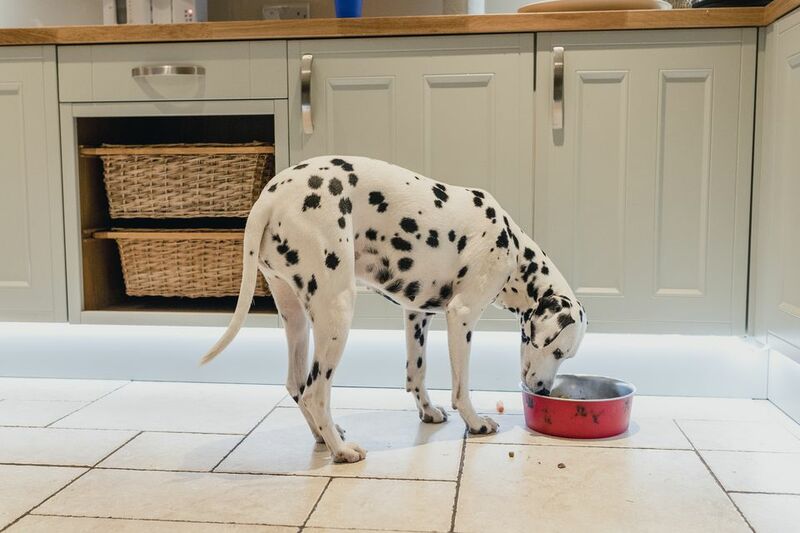 If your pooch is tall, has joint issues or digestion issues or tends to be a messy eater — or all four — check out this elevated dog bowl from Neater Pet Brands. Its design totally contains splashes and spills, and actually separates spilled food from spilled water. How? Spilled food is contained around the bowl, while spilled water drains into the bowl’s lower reservoir. Plus, the elevated design improves dogs’ digestion and reduces pressure on their joints. Best for dogs weighing 30 to 100 pounds, this elevated set comes with one seven-cup stainless steel food bowl and one nine-cup stainless steel water bowl, as well as four non-skid inserts. The elevated bowl for large dogs from Neater Pet Brands measures 8” high. If your dog is extra tall, Neater Pet Brands sells extendable legs are compatible with this dog bowl and can raise the height to 11-inches. If you just got a new puppy or have a small dog, check out this stainless steel dog bowl set from KEKS. Featuring bacteria-resistant, easy-to-wash stainless steel bowls and a spill-proof silicone mat, even the messiest eaters won’t leave you with post-dinner clean-up. The spill-proof, skid-proof silicone mat will catch any food or water spills, and will keep the bowls in place while your puppy or small dog eats. The materials in this set are eco-friendly, too. The mat is made from BPA-free silicone, so you can rest assured your dog isn’t being exposed to potentially harmful chemicals. This set of bowls comes with a free, collapsible travel dog bowl. You can clip this bowl to your backpack, purse, dog crate or leash during travel thanks to carabiners. It’s super lightweight and easy to pack, so it won’t take up too much space in your luggage either. If you have a large dog, you know they can be enthusiastic eaters. But even the most excitable diner can’t knock over this elevated dog bowl from Pawfect Pets. It’s super sturdy frame weighs eight pounds, preventing spills, tipping and nudging during mealtime. This bowl’s elevated design reduces neck strain and joint pressure in larger dogs, who often develop joint problems as they age. Plus, eating at an elevated level — rather than ground level — reduces digestive issues and bloating (read: dog farts) in larger breeds. This set comes with four 56-ounce stainless steel bowls that are bacteria-resistant and dishwasher safe. Silicone rings keep the dishes securely in place to prevent leaking, spilling and noise while your dog eats. If you’re unhappy with your purchase for any reason, simply contact Pawfect Pets for a hassle-free return. If your dog eats too quickly and has digestive issues, obesity or bloating, check out this slow feeder from Outward Hound. With over 6,600 reviews, it's safe to say this product is effective. The mazes within this bowl are designed to slow your dog’s eating significantly. Slower eating time means improved digestion and less bloating. The various patterns make your dog’s mealtimes more interactive, too; he’ll love to figure out the puzzle while he munches on his breakfast. This bowl is available in two sizes — small and large — and can hold two and four cups of dry dog food, respectively. Plus, you can wash this dog bowl on the top rack of the dishwasher for quick, easy clean-up.